Ray Dalio, founder and chairman of Bridgewater, the world’s largest hedge fund, said that he owes all of his success to meditation. This seems to be an extremely forthright statement, given the time and skill one would attribute to becoming an economic and financial superstar. However, with thousands of years of evidence behind it, it’s no wonder that more and more people are turning to meditation to combat the stresses of everyday life. With all the complexities of a technologically connected and globalized world, the stress rates in men have never been higher. And while people band the word ‘stress’ around like it’s a transient emotion, stress is, in fact, extremely damaging to your mind and body. While many see stress as an emotional failing in the ability to cope, stress is primarily a physical response, brought on by the ‘fight or flight’ instinct, where hormones such as adrenalin, cortisol, and norepinephrine are released into the body, getting the muscles ready for physical activity. Of course, when considered logically, it makes sense that if a great deal of blood is being diverted to the muscles needed to battle or bolt, there is less blood in the brain, helping it to function effectively. This leads to a difficulty in being able to think coherently in the short term. Stress, however, can be far more damaging in the long term. Elevated cortisol levels in the body lead to insulin resistance which causes high blood sugar and Type 2 diabetes. Equally, it affects bone health and the functioning of the immune systems, while decreasing fertility and libido. Elevated cortisol levels can also cause abdominal weight gain, which explains why many city working men have large waistlines, suggesting a buildup of fat around the vital organs. In this respect, stress is extremely damaging and finding a solution that works to deter it is integral to a healthy lifestyle in men. This brings us to how meditation and natural remedies such as, Relax (Holy Basil) can help to relieve stress and decrease the risks of these medical conditions. 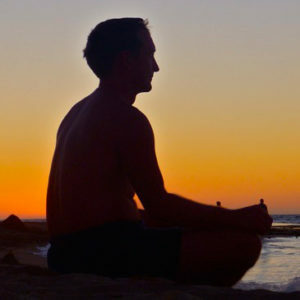 Although meditation has been used for thousands of years, mastering a particular technique can be difficult.Luckily, in the 1970’s, Harvard physician Herbert Benson created a particular style of meditation which aimed to deal specifically with stress. This style of meditation was known as ‘Relaxation Response’ and was designed to specifically tackle stress by eliciting the opposite reactions within the body that stress creates. The 10-minute practice helps to slow down the breathing and pulse rate while lowering blood pressure and metabolism rate. Start by taking an all-natural stress relief supplement, such as Relax, with a big glass of water. Think of a positive word, a phrase or a sound that makes you feel confident. Close your eyes and breathe deeply, in and out of the nose. Repeat this sound to yourself, either out loud quietly or in your own head for 10-20 minutes. While doing this, think about relaxing the body, starting with the feet and working the way to the head. At the end of the 10-20 minutes, you will feel physically relaxed, while the extra oxygen will have helped blood flow to your brain, helping to clear both your mind and body of stress.